Welcome to the BoBunny Design Team November Blog Hop! I hope you are enjoying this month's blog hop! You should be arriving here from Irene Tan's blog, where I am positive you were inspired by her talent. I'd like to remind you to make sure you are collecting the answers to each of the questions you found on the BoBunny blog. Once you have all of the correct answers, enter them on the BoBunny blog using the Rafflecopter widget. The more answers you enter the more chances you have of winning. One lucky winner will be randomly selected from all of the correct answers to receive a fabulous BoBunny Elf Magic prize package!!! Our theme this week on the BoBunny blog has been all about family. I don't have a large immediate family, because we don't have any children, but my husband and I make a great family, together with our horse Woody! He is an American Paint Horse and he is my husband's pride and joy! I love him too, but mostly because he makes my husband so very happy. We recently had some "family" photos taken by our friend Tom with Poses A Studio, so of course I felt compelled to scrap one of them using BoBunny's gorgeous The Avenues collection. Shortly after this photo was taken, we extended our family and adopted a 9 year old Golden named Milo. So now we need to get a new "family" photo taken! Juliana Michaels - You are here! 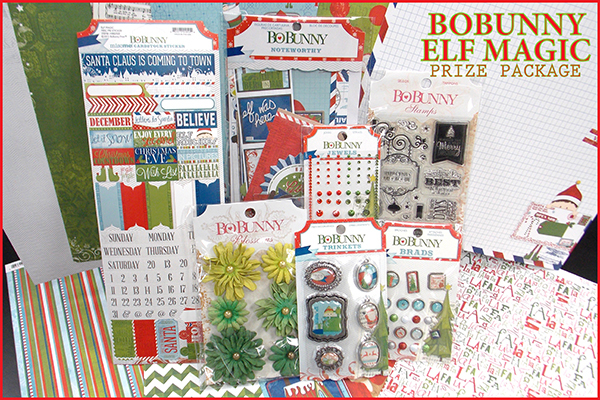 This is the awesome Elf Magic prize package that BoBunny is giving away to one lucky winner! Thanks so much for stopping by today and now it is time to head on over to Kaori's blog for more amazing inspiration! Beautiful work as always Juliana! I absolutely love how you used The Avenues collection. What a beautiful horse and I love your puppy dog! Beautiful. Congratulations on your new dog too. Beautiful layout and Woody is just gorgeous! My first baby was a painted pony named princess. Amazing LO, the shutter patterns really give it the country feel and also the colors. Love horses and your family addition is very cute. What an awesome layout Juliana! 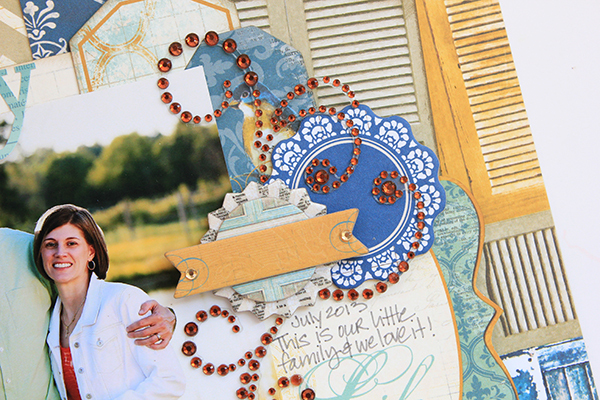 I love your little family and you showcased them beautifully in your project! Such a vibrant fall layout. Just beautiful! What a wonderful layout. I love your family photo. Great page all around. A great-looking family too! You have a beautiful family Juliana! I've always wanted a horse but ended up with five daughters instead. I would be more than happy to share anyone of them with you!! !lol I also have three granddaughters and a grandson due now! Your layout is so warm and inviting and your horse is a real beauty! TFS! All the best! :) Drop by sometime would love to see you! what a wonderful design and color combo for your layout! 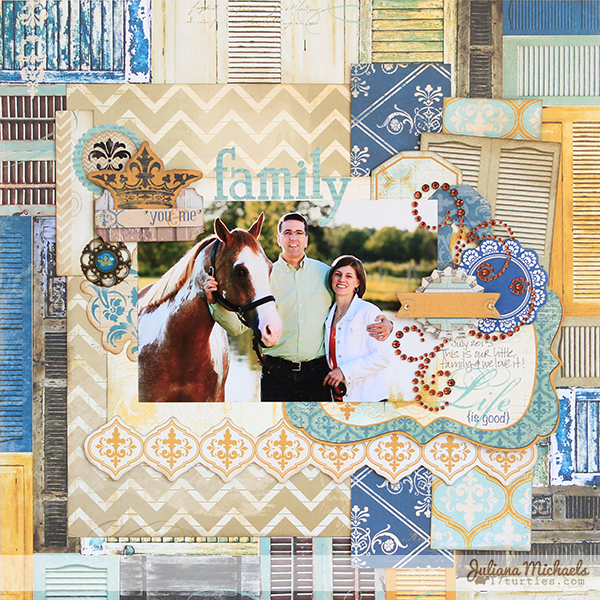 Such pretty layering and I love how you mixed the patterns so wonderfully - love the photo, too! What a lovely family photo! Your layout is great! love the colors and patterns! Wonderful embellishments! Gorgeous layout. I love it. Thanks for sharing, Johanne Lacombe. Love love love love your lo!!! LOVING the layers and the door paper!!!! And YAYYYYYYYYY for Milo!!! He is just so cute!!!!! love the color combo, one of my faves. beautiful horse, and layout. thanks for sharing. 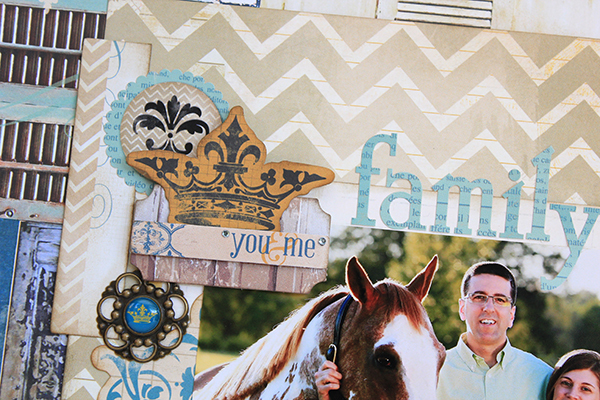 DELIGHTFUL layout - great photo and BEAUTIFUL papers, LOVE the colours and patterns you have combined!!! Gorgeous layout! 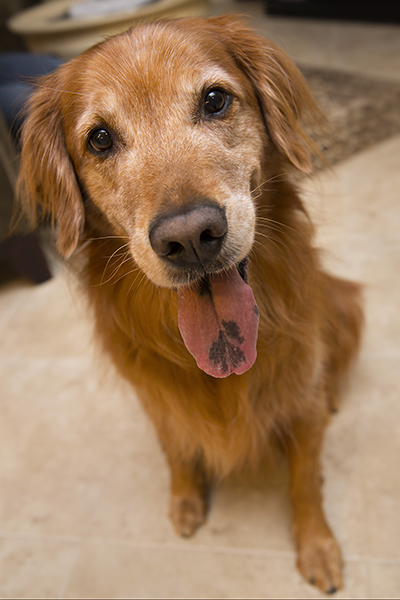 Lovely horse and scrolling down further...congrats on opening your home (and heart) to a beautiful golden retriever! Awesome layout, milo is adorable! Gorgeous Lo and lovely picture!!!!! Love your layout and the beautiful colors you selected. Lucky horse and doggie to have been chosen to be in this special family ! Love this page Juliana! That background paper looks awesome with the other mix of patterns you added! And such a great photo of you and your hubby! Beautiful.. I love it! Thanks for sharing.